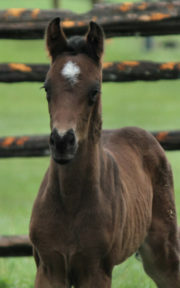 EM Chenya MRF, purchased last year from Maple Run Farm, has graced us with a china-doll filly, balletic and typey. This sweet girl was bred by the Langers – and I was very impressed with the breeding choice they had made. “Tanzy” has fulfilled expectations. She has been purchased, at one day old, by my neighbours Chris and Jean-Yves, who anticipate a delightful journey bringing her to maturity. UPDATE: Tanzy had very good remarks from the Jury at her Hanoverian Inspection and Foal Show. 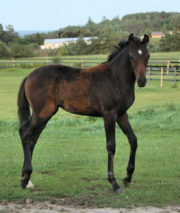 She was praised for her beautiful, feminine type, with a big eye; correct foundation, long legs, excellent walk (typical for Furstenball offspring), and rhythmic trot, with very good use of the hind end. 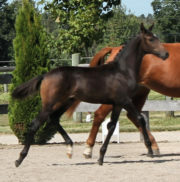 She ended as “Reserve Champion Dressage Foal” – 2nd only to stablemate Foreign Affairs! 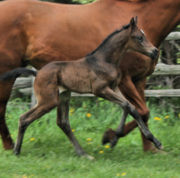 Furthermore, at the end of the Verband’s 2017 Inspection tour, Furstentanz was also chosen as a recipient of an Albert Kley Memorial Top Ten Foal Award for 2017. These videosnippet show her at just 2 days old, and again at her Hanoverian Inspection; while the pictures cover one day through 3 months.